I’ve learned a few things on this mock-up project and thought I would share. The clients have given me permission so here goes! I created this mock-up for husband and wife clients in Panama City, FL. They lost their house in Hurricane Michael last year. Their furniture and other belongings were hit-and-miss regarding their salvagability. Their dining room set, which consists of table, chairs, and buffet, is a family heirloom and, fortunately, salvageable. The dining set is decorated with a carved Asian design with red/cranberry and green accents. The table had four decorated panels in it, as illustrated at right. The chairs have a variation of the Chinese Shou symbol—symbolizing longevity—on the inside backs, as shown below right. The four decorative panels swelled badly from the water and had to be removed from the table. The table, chairs, and buffet have water spots, but the clients believe they can be removed. They contacted me for consultation on the possibility of mosaic panels to replace the wooden ones. The panels are each 16” h x 29” wide and 5/8” thick. One of the challenges will be achieving an exact 5/8” thickness. Another challenge is that the wife wants to do as much of the work as possible, and she has never made a mosaic before. It is this second challenge that helped give me a starting point. I immediately thought about the beautiful metallic streaky Brilliance line of vitreous tile from WitsEnd Mosaic. These tiles are elegant enough for a dining table, I think, and would be relatively easy to work with for a novice. I showed the clients the full sample range of these tiles and they liked them very much and thought they might work for this project. They chose the dark cranberry (#267) as it matched the accents on the original panels and buffet. In these images, the color may look more a brick red, but it is definitely more of a cranberry. The client entertained the idea of repeating either the symbol or elements of the original design on the mosaic panels. I did not feel the original design was feasible. However, the idea of using the symbol was more feasible and would allow for me to do the symbols and let her fill in the rest with whole tiles. This was the basis for my mock-up. Above: Table Panel Mock-up, in three sections. I could not get the lighting the same on all three sections—aggravating! It was a bit drippy outside for photos so I took them in my studio. The leftmost and center panels are the same tile and natural gray grout. The rightmost panel is the same tile but a darker brown grout and the tiles are in a brick pattern, versus the grid pattern of the other two. I decided to break the 16” x 29” into three sections for several reasons. I wanted to illustrate the two different laying patterns: grid and brick. I also wanted to try a couple of grout colors. And finally, I thought that making the middle section square would allow for some other use for that piece, outside of the mock-up. Oh, and I thought it would be easier to ship smaller sections; I’ll find out about that in a few days. The clients did not specify a desired color for the symbol, so I chose the light metallic and also created the brown and green digital mock-ups below. Brown because I thought it might integrate with the table better, and green because green is one of the accent colors in the furniture. As you can see from the images, I decided to maintain the grid pattern behind the symbol. This resulted in some very small and tricky cuts which are often difficult to get to sit and stay level, especially little triangles. While I do prefer the effect of maintaining the laying pattern behind the symbol, I wanted to come up with a simpler laying pattern that would avoid those tricky cuts (that would result from the brick laying pattern as well). The rightmost image above shows a digital illustration of an alternate laying pattern for the tiles around/behind the symbol. By surrounding the symbol with a circle of whole tiles, I can break from the overall laying pattern in a way that won’t cause visual confusion. Originally, I grouted the symbol the same natural gray as the darker tile. I considered grouting it with a lighter grout and went back and forth on the idea before deciding not to. At right is the original before I scraped out the grout and used a lighter one. This was a bit of a messy process and did not go exactly to plan, but I did manage to lighten the symbol grout—just don’t look too closely. 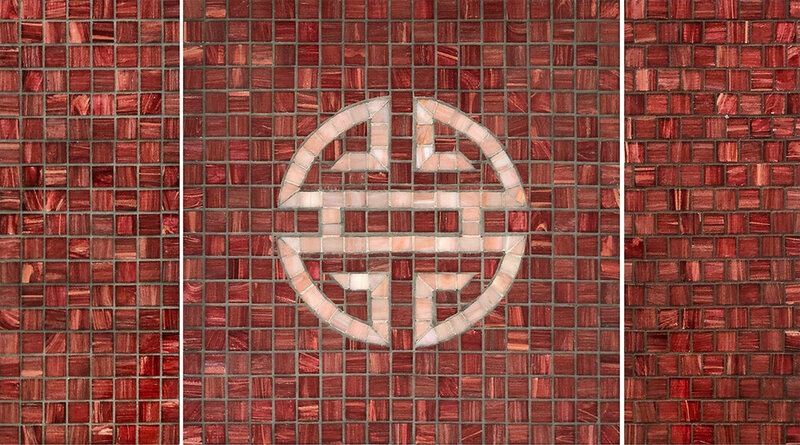 Obviously, if the clients choose such a lighter symbol, I would get the grout right from the start. So why did I change the grout? Although the symbol, with the natural gray grout, looks well defined and cohesively distinct at a viewing distance, I realized that it fractured too much at the kind of distance from which it would be viewed while sitting at the table. I did not anticipate this and so leaned something very useful. Symbol with original natural gray grout. I’m almost ready to pack the mock-ups, both mosaic and digital, and ship them to Panama City. I’m still working out a couple of ideas on getting to the 5/8” thickness that is necessary for the panels. They will be able to lay these mock-ups into one of the panel sections on the table and visualize what the table will look like with all four panels mosaicked in this way, with or without the symbol..
I’m also still working out the logistics of the potential of both she and I doing the mosaic work. I know it’s doable, but there are still decisions to be made that will impact the execution of this project, should they want to go forward with it. I do applaud the wife for wanting so passionately to do as much of the work as she can, and I hope that I can help make it happen.